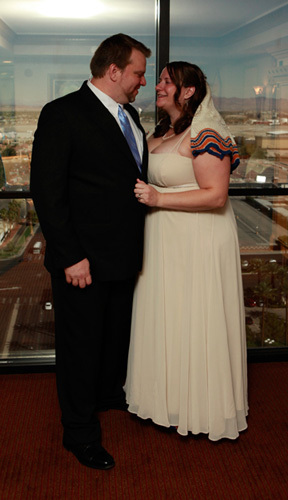 One year ago today, we said I Do in our gorgeous suite at the Luxor Hotel overlooking the Las Vegas Strip. My brother and future sister-in-law were there as our witnesses (and celebrating their 2nd dating anniversary) and my fab friend Kelly was there due to her husband being in another 10.10.10 Vegas wedding. Talk about perfect timing! Sure, we’ve had our share of both good times and bad this past year. We made decisions about growing our family via foster adoption, we visited his family and spent a week in West Virginia, we spent 3 days in Orlando for MegaCon, and learned how to deal with seeing each other for only a couple hours a day due to our opposing work schedules. Happy anniversary, my love! I cannot wait to move outta here, get grown-up jobs and raise our children together.